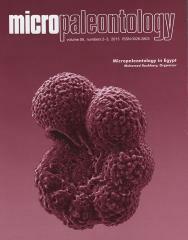 ABSTRACT: The detailed micropaleontological analysis carried out on four offshore Oligocene (Tineh Formation) Nile Delta successions revealed the identification of 44 foraminiferal species and subspecies. Nine benthic and two planktonic zones are identified. The established benthic zonation has been chronostratigraphically calibrated with those based on the planktonic foraminiferal ones. This sequence is assigned to the Oligocene (Chattian), and possibly extends to the upper part ofRupelian.Aremarkable feature of thisOligocene succession is the almost complete absence of planktonic foraminifera in its major lower part, a situation that caused a difficulty of subdividing it into smaller units. The environmental interpretation for theOligocene succession implies deposition under a background of persistent subsidence with remarkable paucity or complete absence of any calcareous fauna, probably related to deposition in carbon dioxide-rich marine conditions hostile to the precipitation of any calcareous material and caused by volcanic activity, lowered temperature or situation under the lysocline or carbonate-compensation depth.